If Main Street is So Great, Why Are We So Embarrassed to Show It? It's funny how the business community supposedly loves Main Street as a five-lane, one-way freeway, yet nobody ever represents it as such in renderings of new developments or upcoming projects. I love the guy cycling along merrily on Main Street and the people strolling right at the street edge. I guess they won't mind losing their elbows to a transport truck. 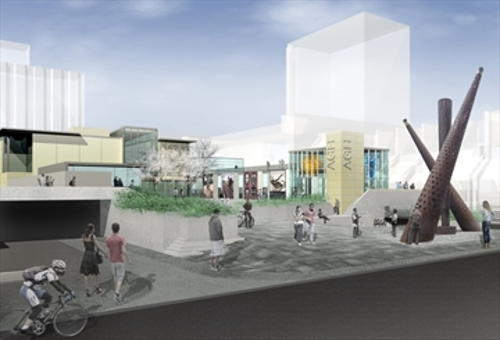 Here's a recent rendering of the new McMaster downtown health campus at Main Street and Bay Street. They turned Main Street into a two-way street and added a bike lane. Look at all those people! I wonder why the designer didn't add a transport truck loaded with 19-tonne steel coils. Remember this rendering of the Homewood Suites Hilton at Main and Bay? Lots of people, one car. If Main Street is such a great competitive advantage over Toronto, as some City Councillors seem to think, why does everyone take such great pains to hide it and make it look more like a normal city street in, well, Toronto? Another thing: why do we keep pretending Main Street has an efficient design, even for drivers? An efficient street would make the most use out of scarce road space, but thanks to timed lights, all the cars on Main Street drive in clumps and the street is completely empty the rest of the time. It's the worst of both worlds: blasts of high volume, high speed traffic - including transport trucks - punctuating stretches of desolation. 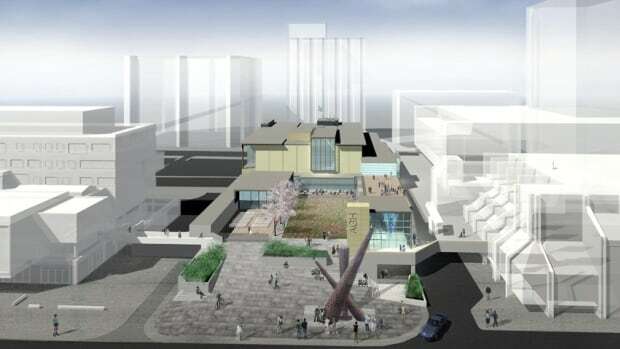 Another earlier rendering of 'Education Squre' (current Mac downtown site). These renderings also greatly minimize the horridness of Main and Bay, and seem to show both as two-way, normal looking streets. Renderings are only ever loosely based on reality, and more about market cliche: off-white consumers with perfect teeth. Still hold out hope for an FPO mock-up using inclement weather, partially denuded trees, and dirty vehicles and patchy roads. I'm not asking for patchy roads and dead trees. How about something even close to real life on Main. The renderings always make life look uber grand, but at least they perfectly depicted the design and feel of the street. Again, completely accurate representation of the street. There's a reason architects refuse to show a 5-lane freeway with trucks and tiny sidewalks next to their beautiful designs on Main. I'd sure love to see this article written with a positive look forward. If you're pushing for complete streets or some other solution, then by all means, push! 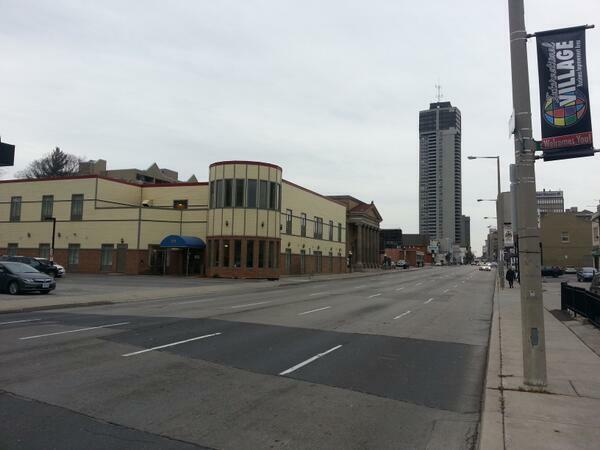 Bashing the "horridness" of the heart of our downtown just makes people grumpy. It's not as bad as this site makes it to be. I agree it can be better. However I completely disagree with horrid, disgusting and other negative comments. It's a big turn off for me on the overall cause. Peoples eyes see different things. I see positive change happening, just not quick enough for some people I guess. I'm talking about the street itself, not downtown. I see no changes happening on Main, let alone "not quick enough for some people". What am I missing?? It looks the same today as it did in 1960. I see miniscule positive changes but no will to change the things that actually matter, i.e. wider sidewalks, dedicated/protected bike infrastructure and two-directional car lanes designed for a continuous, slow flow of traffic on Main. Those are the design factors that have been identified for King and Main time and time again on this site and in multitudes of urban studied. What positive change have you seen happening in these areas? Zebra crossings? My definition of 'positive change' requires that something about the way Main/King work actually changes. Main is horrid. It needs to change. Main Street is also pretty disgusting, let's be honest. He's riding on the left-hand side of the street wearing some sort of futuristic battle armour. Perhaps appropriate for riding in the left-hand lane of a five-lane expressway, but I'm not sure how that's meant to be part of an appealing urban landscape. Maybe they were trying to capture the moment between green waves. Or paying homage to the surplus capacity? I take your meaning. But I also regard renderings as flights of fancy. Suburban tract homes are no more faithful. I want very much to have the optimism and faith that these drawings were intended to show the city not as it is now, but as it will be in the near future! I'm glad you are concerned about health impacts of emissions. You'll be glad to know that people walking and cycling don't emit any. So, the more of them we can encourage and accommodate into our road network, the better off everyone is. Where do all the east/west cars go in Toronto between the Gardiner and 401? Why don't we bulldoze Rosedale, Casa Loma, the the Bayview/Eglington neighbourhoods and anything else in the way and build a new east/west highway through the centre of Toronto for the poor souls who have to drive all the way to the 401 or Gardiner to find a freeway. Oh wait, they aren't poor souls. They are rich in fact if they are lucky enough to own property in central Toronto where streets are calm, leafy and property values are insane....far from any freeways. Funny how that works. Hamilton has a stunning ring freeway network now. So stunning in fact, it's quicker to take the 403-Linc-Red Hill to reach the east end from Westdale instead of using this gross Main St freeway. If Main was a proper city street like these renderings show, it would be even quicker to use the ring freeway. If people don't want to use our nice highways, let's turn them into linear park space for local neighbourhoods. I have been living in the Annex since May and the pedestrian experience is brutal, far worse than Hamilton. Those leafy residential areas you mention are packed with SUV's which barely slow at stop signs. Even when they do stop, most drivers "encourage' pedestrians to increase their walking speed by entering the intersection soon after you've started crossing. Curiously enough, I feel safer walking on Bloor St than in the residential areas. The reason? Lights that are timed so there are gaps in traffic. Here's the thing: if, heaven forbid, something goes wrong? Which traffic is more likely to kill vs. wound? On a low-speed street, most of these "dangers" result in an angry exchange of words (and possibly insurance information). On a high-speed street, if something goes wrong, somebody dies. Even if it's easier to cross, that doesn't mean it's safer. Where do you propose that all the east-west vehicle go? Some people will continue to drive on the various streets. If we convert our streets to two-way, drivers will have more options to get from a given origin to a given destination. Some people will use the city's ring highway system, which is already as fast as our surface streets, even though they are also configured as de facto highways. Some people will take transit for some trips, especially as Hamilton transit continues to improve with dedicated lanes and, once the Ontario government funds it, LRT. Some people will take bicycles for some trips, especially as Hamilton's bike lane network continues to improve with protected bike lanes that connect to each other and take people to the destinations they want to reach. Some people will decide to take some trips at different times, pushing non-essential trips outside rush hour. Some people will decide to combine some activities in fewer driving trips. Some people will choose alternate destinations for some errands. Over the longer term, the shifting economics of driveability vs. accessibility will bring more destinations within closer distance to more people, reducing the need for long driving trips. 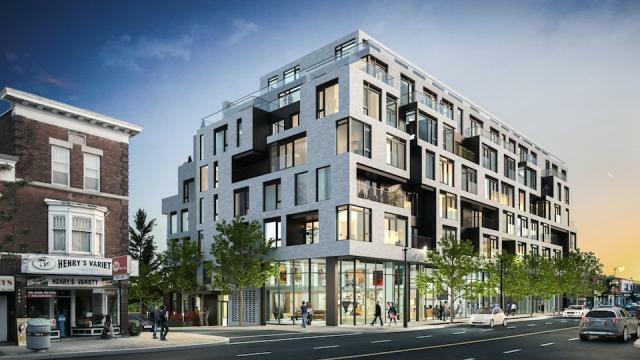 More people will move into denser, more mixed-use urban neighbourhoods and reduce their driving even further. The important thing to remember is that all the myriad individual people make choices in a context, and when you change the context, people's choices start to change as well. what about the health effects with emissions? Cars emit just as much pollution at high speed as they do at low speed (more, actually), so when you reduce vehicle speeds and vehicle throughput on a street, you actually reduce overall emissions. You reduce emissions further when the transportation network encourages some trips to be made using alternatives to the single-occupant automobile. Generally, cities that commit the most fully to making it as easy as possible to drive have the worst overall air quality, since more people driving longer distances more frequently produces more air pollution. waterdown has growing congestion on dundas street during rush hour. if main street in downtown hamilton is the solution to moving high volumes of traffic at high speed through downtown areas i think the time has come to turn dundas street into a one way west bound highway. after all, highway 5 is an important intercity truck route. we can twin this with making parkside drive one way east bound. think of how well all the businesses on dundas street will do with the same amount of cars traveling way faster in a single direction with limited parking and reduced pedestrian activity! let's get on this! let's save waterdown downtown! after all, i have a right as a citizen of hamilton to drive as fast as possible through any community. i want to be able to get from clappisons corners to burlington in 5 minutes. Despite the lane reduction, traffic flows so smoothly through the intersection that there are no cars left on Main by the time the light turns red. As you can see, traffic flowed smoothly even with 3/5 of the lane capacity removed. Sigh. Your sarcasm is neither intelligent or appreciated. I thought the gaps in traffic was so pedestrians can cross the street safely. But you know that, you're just trying to get your nonsense to cover up the truth. Who would ever use an "entrance" off Main St? Nobody walks on that wind tunnel!